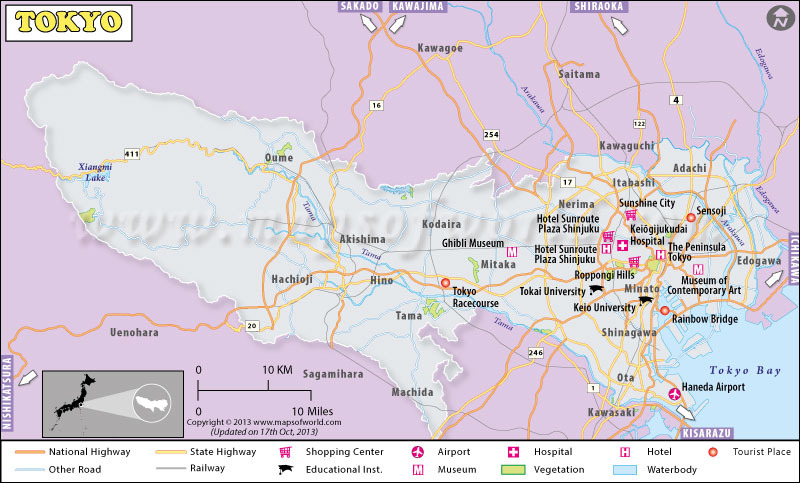 Explore map of Tokyo, it is one of the forty seven prefectures of Japan, and is both the largest city and capital of Japan. The Greater Tokyo Area is the most populous metropolitan area in the world. Since 1603,Tokyo enjoys a regal history. Today, the city and its suburbs has a population of 17 million and is the largest among the 47 prefectures of Japan. Often thought as a city, Tokyo is also a metropolitan prefecture. The metropolitan government of Tokyo manages the 23 special wards of the city. Located approximately at the central hub of the Japanese archipelago and in the southern region of the Kanto area, the city shares its borders with Chiba Prefecture to the east, Saitama to the north, Yamanashi to the west and Kanagawa to the south. With an overall area of 2,187 square kilometers, the city is considered to be the smallest administrative divisions in Japan. Tokyo offers innumerable transportation options, starting from buses and trains to ships and monorails. By Train : As trains in this city, including the JR Keihintohoku Line, the JR Yamanote Line, the JR Chuo Line and the private railways in the 23 wards, run on a frequent basis, you don’t have to wait more than 5 or 10 minutes when in Tokyo for availing a train. However, they run at less frequency during the early hours of the day as well as at late nights. By Bus : Tokyo has an efficient bus network. The fixed-fare front-boarding buses mostly operate in the 23 wards of Tokyo. Buses that allow you board at the rear door operate outside these 23 wards. Always ensure you plan your route in advance, when taking a bus in Tokyo. By Taxi : There are over 50,000 taxies that run to and fro in the city. You can avail of them from the taxi depot at the train stations as well as from the airport. There are some taxis that accept credit cards for making payments. Besides, you can also rent car services for sightseeing within the city. However, for this you need to make advance reservations. Most rental car services remain open 12 hrs a day, i.e. from 8 am to 8 pm. By ferryboats : You can also avail high-speed ships and ferryboats in order to travel destinations like the Ogasawara Islands and Izu Islands. You can take a ferryboat from Takeshiba Pier in order to reach these islands. The best time to visit Tokyo is in spring (March, April, and May) and autumn (September, October, and November). August is the most humid and hottest month here; hence tourists should not plan their tour then. Ganjitsu or New Year is believed to be an auspicious day. On this day, Japanese visit the nearest temple or shrine for attaining purification. Meiji Jingu Shrine lures the biggest crowds, soon followed by the Sensoji Temple and the Kawasaki Daishi Shrine. Toray Pan Pacific Open Tennis Tournament is an annual event which is organized at the Tokyo Metropolitan Gymnasium in January or February. This tournament is exclusively meant for ladies. The Doll Festival, usually referred to as Hina Matsuri is celebrated on the third day of March. Held on 21st of April, Yabusame festival is celebrated for honoring the past heroes. On this day, various horseback archery contests are organized at Tokyo's Sumida Park. Tokyo Tower is noted for its grandness as well as its impact. The tower witnesses a warm orange glow during morning as well as later afternoon. The best traditional market in Tokyo, you will get anything under the sun here! So, if you are in search of some quality goods at a reasonable price, then this is perhaps the best place to hop into. The market is noted for its unique atmosphere and you can get best buys on items like fruit, fashions, snacks, fish, traditional Japanese apparel, jewelry and shoes. Meiji Shrine is a world renowned shrine that lures thousands of tourists round the year. Besides the shrine, you will also find a garden and teahouse here. In fact, this is the best lily garden in Tokyo that houses dual annex museums and a self-pumping well. Though less popular, yet the Gokokuji Temple is noted for surviving the fire bombings of the Second World War and the Great Kanto Earthquake of 1923. The temple is also noted for being least renovated and most enduring. Your excitement doubles if you plan your stay at a luxurious hotel in Tokyo. Thankfully, the city promises to offer you the best stay options ever. For people who don’t mind spending on their vacation can plan their stay at hotels like Park Hyatt Tokyo, The Capitol Hotel Tokyu, Shangri-La Hotel, and Mandarin Oriental. Those on a lesser budget can look for options like Hotel Yanagibashi, Hotel Sunroute Higashi Shinjuku, Tokyo Hotel Horidome Villa and Oak Hotel.